Going to the doctor as a child usually meant going in and getting a shot. Of course, no one wants to have a needle jabbed into their skin, so this is not really a fun time for kids. It’s something that kind of sticks with you, even into adulthood (say hello to trypanophobia). There are ways to deter the pain and anxiety associated with getting these pin pricks. 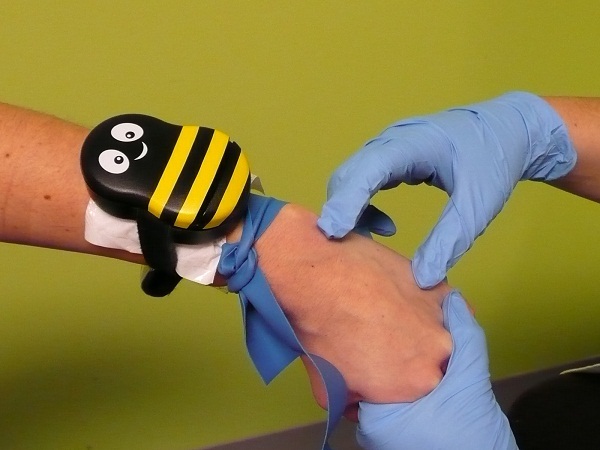 Buzzy is a cute tourniquet that will distract your child from even realizing what’s happening. The bee is a buzzer that will vibrate and confuse the nerves in your body so you aren’t paying attention during the painful part. The cold pack is useful as well, but the placement is the most important aspect. This does even better when the child has something to focus on, such as pointing out something that have to focus on in a book or on the wall. One of these will cost you $75 for just the buzzer aspect, and wouldn’t be a bad idea for doctor visits. While most of us likely wish we had one when we were little, there’s no harm in getting one now if you’re still iffy about being poked by a needle. I’ll have one before anyone comes anywhere near me with something that might be a little bit sharp, thank you very much.